By 1996 it was obvious that the FR would be rebuilding the WHR. The trackbed had lain fallow since the passing of the demolition train 54 years earlier and any remaining buildings had become progressively dilapidated. Nevertheless it seemed sensible to walk the whole trackbed from Dinas and record any remains from NWNG and WHR days. This was to be organised in several stages giving plenty of time for thorough examination. 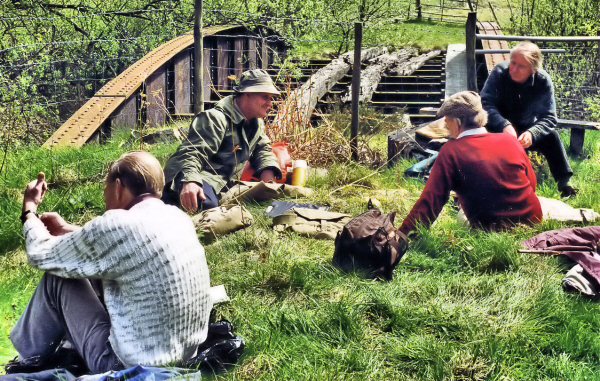 Eventually, in the summer of 1997, the Trackbed Survey Party – which varied in personnel on each occasion – reached the Plas y Nant bow bridge one lunchtime. This provided the ideal spot for a picnic with the Afon Gwyrfai’s music gurgling in the background. It was against this idyllic backdrop and from idle lunchtime chatter that the concept of a WHR heritage group was borne. After all, the FR had one, so why shouldn’t we! David Allan – whose idea the trackbed surveys had been – was volunteered as chairman; Michael Davies agreed to be treasurer and John Keylock both secretary and membership secretary. Subsequently Cedric Lodge was invited to join the committee as representing the WHR Society. The first journal appeared in November of the same year. So the group came into being, independent, feisty yet constructive, and with the initial objective of saving as much as possible from the inevitable destructive element of reconstruction.